Sigma, Omega (optional) and Alpha (always) LCD Signature Pads comes with an internal USB2Serial converter. This units have a "FT" in the product number, please refer to the data sheets for more information. The driver can be downloaded from the link below. With a virtual com port you end up with what appears to be a native USB-connected signature pad (with all power pulled directly from the USB port), but works in the same manner as a serial pad, in that it converts the USB port into which it is plugged into a virtual com port. From there, the virtual com port can be mapped to the server. These pads can be plugged into a terminal, fat-client or thin-client machine, and the com port on the client mapped via back to a com port on the server. Ultimately, through this mapping, a signotec pad physically connected to the client is virtually plugged directly into the server's com port. Where com3 is the number of the (virtual) COM port on the server (ports 1 through 9 are available for mapping) and com1 is the number of the client COM port you want to map. Press ENTER. Be sure, that your virtual com port on the client is one in this example. In general it is a port behind 2, because one and two are physical com ports on the client. The list that appears contains mapped drives, LPT ports, and mapped COM ports. To use this COM port in a session on a Citrix server, install the device to the mapped name. For example, if you map COM1 on the client to COM5 on the server, install the COM port device on COM5 during the session on the server. Use this mapped COM port as you would a COM port on the client computer. It is possible to access the signotec pads with RDP (Remote Desktop Connection) as well. 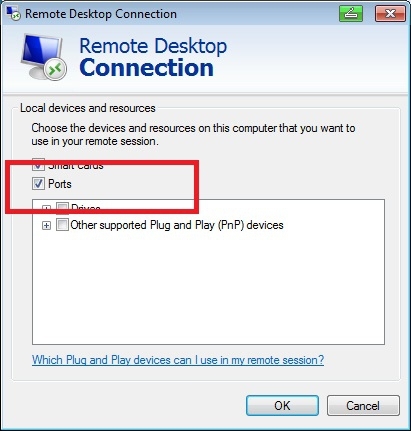 Therefore you have to configure RDP to use your local COM ports in your remote session. Activate 'Ports' as shown in screenshot below. Connect your signotec signature tablet to a Citrix or Terminal Server via com port mapping or Remote Desktop Connection.